Most people connect Ebisu, the major district of Tokyo’s rather famous ward Shibuya, with its restaurant and bar scene. After all it was developed around a beer brewery in the late 1920’s. But you can find several quiet and homey spots in Ebisu, too, making it a popular residential area nowadays. There we’ve met Jessica A. (27) for an interview. 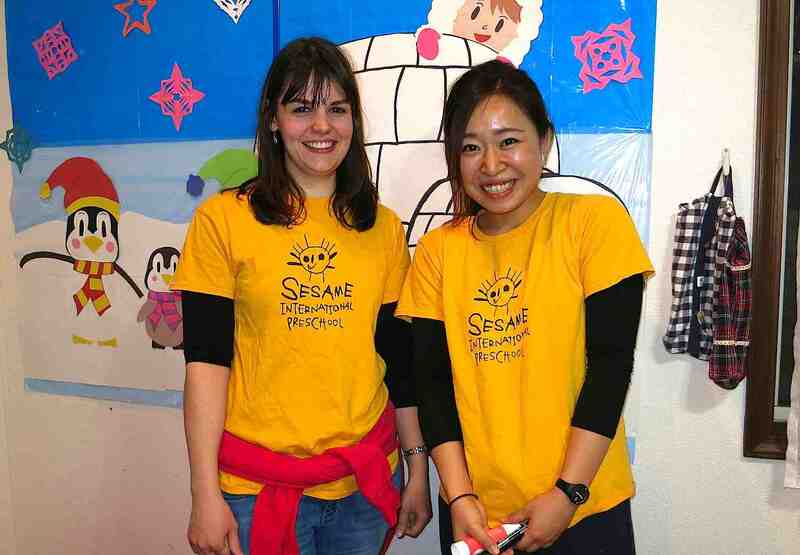 She is working at Sesame International Preschool, founded in 2000 and located right in the heart of beautiful Ebisu. Jessica, can you tell us how a typical work day at Sesame looks like? Well, we are having various programs, based on the seasons, on the age of the kids etc. But in general it can be said that there is a structured daily plan. As the kids are coming from 9am, all staff members have to be here at latest 8:30. We are changing into our school staff uniform first and then welcome the arriving kids. After this, two times a week I’m cooking lunch for the kids and the other three times a colleague is doing it. We are actually serving fresh lunch with vegetables and rice for the most kids. There are some who bring their own lunch, too. At the moment I’m assistant teacher which means I’m responsible for the group of 3-6 year olds at the first floor. The group of the younger ones (1-2 years old) is located at the second floor. As an assistant I’m learning how to lead the group on my own so that my colleagues can take their holidays. Daily activities of my group are: 9:45am: morning circle time, where we sing a morning song and explain what will be done on that day; 10am: the kids take a snack and have play time; 11am: we visit a local park; noon: we have lunch; 1pm: math; 1:30pm: we do a big activity, which includes stationary at most times; 2pm: the kids take a snack and have play time again; 2:45pm: we sing a good bye song, talk about what we have learned today. Around 3pm the kids will get picked up. In the afternoon, I have different duties. There is an other special program, called extended care, for kids that stay longer than 3pm or come later. The staff then will be divided into the late shift who has to take care of the extended care kids, and the rest, who is in charge of making preparations. For example documents, seasonal decoration and of course the activity calendar have to be prepared. The activity calendar shows which daily big activity will be done in the current month. These activities are all educational, but are still supposed to be fun. For instance we are learning letters, numbers, seasons or read from a book and then do some handicrafts with the newly learned information. All activities should stimulate the kids thinking skills while also exercise their motoric capabilities. The goal is for the kids to be able to do minor maths, read and write the ABC and maybe even short sentences before attending elementary school. And at the same time we want them to have a enjoyable time at Sesame. Of course, where 1-6 year olds are around there is always a lot to clean and tidy up. That’s also each staff member’s duty, especially in the evening after 6pm, when all the kids have been picked up. What are your general working times? I’m working Monday to Friday. Saturdays, Sundays and public holidays are generally off, with some rare exceptions such as the yearly Christmas party on a Saturday. All staff members are having New Year holidays and summer holidays, plus 10 freely choosable days off. I’m starting my shifts in the morning at latest 8:30 and can leave shortly after 6pm. My shifts during myWorking Holiday were shorter. At that time I could leave around 4pm. So this right now is not your Working Holiday? Correct. I’m here with an actual working visa, valid for three years. Originally I started this job at Sesame in March 2014, when I came here for a Working Holiday. I didn’t search for a job right after arriving, because I wanted to enjoy some free time and get used to the country before starting a hard work life. But in April it was about time to find a job. Although I studied Japanese Studies in Germany, I didn’t have much confidence in my Japanese. I was thinking “What job can I do without knowing a lot of Japanese?“. An acquaintance of mine then told me that international schools are always searching for foreign staff. I started researching about international kindergartens and preschools on the internet. The website of Sesame International Preschool looked the most appealing to me, so I sent them an unsolicited application via email. They invited me for a job interview, which I had in May. I didn’t even expect that, but the school director asked me to start my ten days of test work on the same day. Of course they need to test you for some days before really hiring you, as they want to find out, if you will fit into the team and can deal with the children. I passed the test! After ten days I got hired as a part time worker, being paid hourly. I worked there until the end of my Working Holiday, so round about nine months. I went back to Germany and graduated university, aiming to go back to Sesame afterwards. And they also wanted me to come again. I went back to Japan, and now here I am in my eighth month as a full time employee in a permanent position. Which language requirements came with the job? You have to speak English fluently. I sent my resume and application in English, too, because the job was advertised in English at Sesame’s homepage. Also, it’s the rule of our school to speak English with the children. Of course you can make an exception, when a kid is new in school, or you can’t calm down one of them and need to try it in his or her mother language. Most of them are Japanese, but we have some foreign kids, too. After all it’s an international school. It’s not necessarily needed to be able to speak Japanese, but it’s definitely a plus if you can understand and speak at least a little bit, because some parents, which you have to communicate with, aren’t fluent in English. And of course the kids aren’t neither. Most of them can’t express themselves in English, yet. Do you think working at Sesame helped you improving your Japanese? To be honest, there are jobs out there that are better for learning Japanese, because our school is leaded to around 95% in English. That’s just the school’s concept. BUT, in some parts, yes, the job helped me to improved my Japanese. Especially because most of the kids are still speaking more Japanese then English. Although we remind them of talking in English, them speaking Japanese is something that can’t be avoided, after all they are living in Japan. But still, because of them speaking Japanese, I learned a lot that I haven’t learned during my Japanese studies. I’m still interested in learning more. And when asking my Japanese colleagues about what a kid just said, they are happy to help me understand. Would you let us know some more requirements? You definitely need to prove that you have worked with children before. I personally have worked three years in Germany as a homework assistance for immigrants elementary school kids. And also as a private tutor. In addition to this, Sesame told me that I would need to do an internship in a kindergarten or elementary school after my Working Holiday. Back in Germany I did a three months internship in a elementary school and provided a certificate about it to become a full time employee at Sesame. It also can be said that the time I worked here during my Working Holiday has been kind of a training for what I am doing now. Without having done that training, I’m sure they would have never sponsored the working visa for me. There are some high hurdles. Sesame makes pretty sure you are actually able to work with children and are a good teacher. The school takes very good care of their kids and searches for staff members that they can trust and that they can place responsibility on. One more requirement is to be a punctual person. Coming to late for work is not an option, because everything has to be prepared as soon as the first kids are arriving. I commute to work around 60 minutes from door to door, which means I have to leave the house at 7:15am latest to ensure not coming too late. In case there is a problem with the train, for example it is delayed because of an accident, you can receive this practical evidence paper at the station you get off the train. If you hand this to the school director, coming to late will be excused of course. But you need to think about the weather, too. You always should check the next day’s weather, because it might be windy or even snowy. Then you should take an earlier train. That’s just out of question. In case of a typhoon the whole school will be closed of course, for everyones safety. This will be announced the day before. Are you enjoying the job? And what don’t you like about it? I love my job! Every day is different. Although you have to follow a certain plan everyday and have repeating duties, it’s never the same. Thanks to the kids. Their behaviour changes everything. That’s what makes the job diversified and exciting. Also, I love children. And my colleagues. I know that I can always rely on them when I have a problem. There is a very familiar atmosphere here at Sesame. That makes it easy to come to work with a smile of your face every day. Looking back, the only thing that I see as a small disadvantage of a Working Holiday in general is that you have a very tight working plan. In the evening I used to come home exhausted. It was hard to follow the main part of “Working Holiday“: the holidays. It was hard to discover Japan, because I worked 5 times a week. When being paid hourly, you have no chance to take a day off without losing money at the same time. Now as an employee in a permanent position that’s luckily a bit different. No. At the beginning of my Working Holiday I applied for a job in a German restaurant, too, because I felt that I needed more money. But in the end I didn’t take that job and instead Sesame’s director offered me to work longer shifts. That helped me a lot. Actually, my Working Holiday helped me learning to live with the amount I’m receiving, while still having a small amount left at the end of the month. I try to spend my money more responsibly, but still enjoying my time in Japan doing the things I like to do, such as attending concerts and meeting my friends. Can you give us a resume about your impressions and feelings about your job? My current job taught me that I definitely need a job in my life that keeps me moving. Where every day is different. I couldn’t sit in front of a computer all day long. I’ve learned for my life that a job needs to make you happy. It makes everything in life easier, if you love your job. In case I should go back to Germany some day and search for a new job, I know it must fill my heart more than my wallet. I really think that I could do this job forever. If it only was located closer to my loved ones in Germany, I wouldn’t have to think twice about that. Would you recommend doing a Working Holiday in Japan to others? Yes! I can recommend it to EVERYONE who is interested in Japan and also into getting to know the real Japan. With all it’s ups and downs. You have the chance to try out living in an other country, but are not forced to stay forever. In the end that one year of Working Holiday turned out to be one of the best years of my life. And it led me to my current life and job in Sesame. I learned a lot about myself, about being more independent and an adult. BUT it’s also important for you to know that you need to be open to a new society, to new things. You have to be eager to work very hard. And if you do so, your Working Holiday will be fantastic.